Burgers are known to be a timeless addiction. Whether it’s a McDonald’s Happy Meal or Burger King’s Mushroom & Swiss, this craving seems to follow us through the ages! 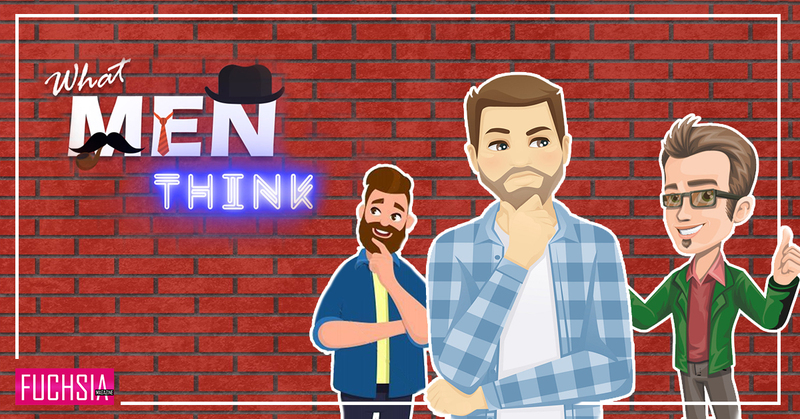 The best kind of burgers, of course, are the ones that have a thick, juicy patty which melts in your mouth with every bite, and that’s exactly what Working Title had in store for us! 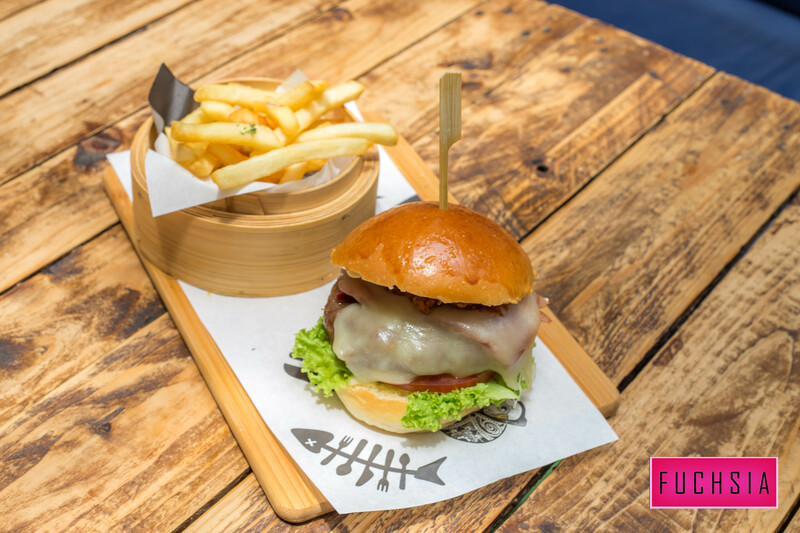 Also known as a burger bar, Working Title welcomed FUCHSIA with a wide array of burger options. 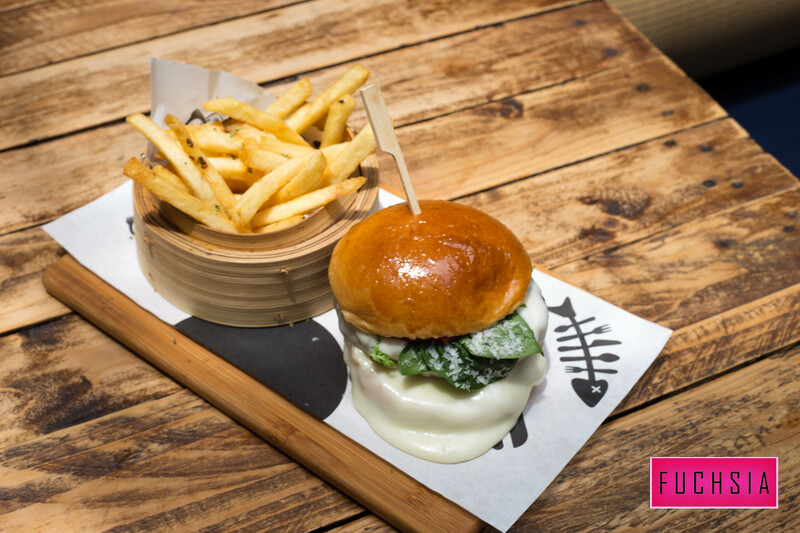 We were spoilt for choice as we picked from 13 burgers on a skillfully curated menu. The café styled restaurant on Arab Street offers a wide range of brunch options, snacks and appetizers, pizzas and burgers topped off with very tempting desserts, smoothies and coffees. They have something for everyone – beef, chicken, salmon and vegetarian options! This halal-certified restaurant has quite an extensive menu and is definitely a pit stop for all your fast food cravings. From the very first step, you can sense the casual, relaxed set-up. The overall ambience is very arty, with posters on the walls giving a very contemporary and rugged look. It was impressive to know that the entire décor was designed and executed inhouse – this included paintings, drawings and graffiti. The seating is comfortable, yet simple-casual, with tables and chairs of varying sizes and designs. The dining area opens up into a brightly-lit open space, which makes you feel like you’re sitting outdoors, yet, it is air-conditioned. With the help of the courteous and very hospitable manager, Rahman, we ordered the most recommended dishes on the menu and their best sellers. This is what I discovered! I was really excited to try this appetiser, due to my intense love for potatoes! The Tater Tots were mini hashbrowns, fried to golden perfection and seasoned with garlic oil and generous shavings of Parmesan cheese. The Tots were plenteous, crisp and crunchy. A must-try for a light snack! ‘Ribena with Chicken? !’ – That’s exactly what I thought. Interesting right? Ribena is a very popular children’s drink. But who would’ve thought Ribena could be part of a savory dish! The crispy wings were layered with Ribena syrup, which added a sweet taste to the meat, but did not overpower it. As much as this was an exciting dish to try, I must admit it to be an acquired taste. 3 out of 4 of us enjoyed it – myself not included. 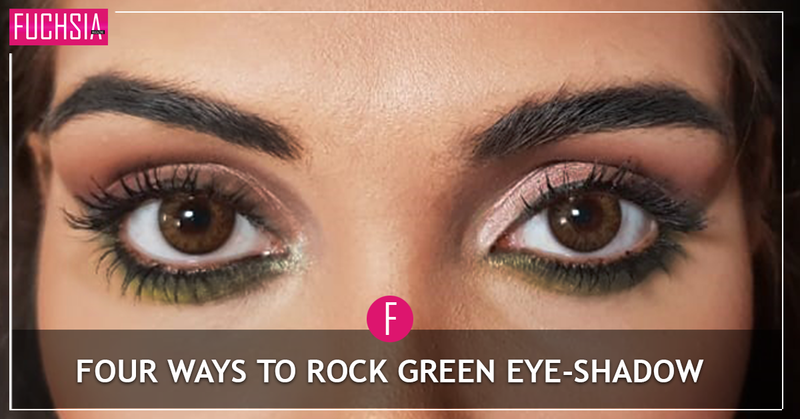 However, we recommend our readers give it a try and tell us what you think! During the fasting month, one of the bestsellers of the Ramazan Bazaar at Geylang Road is Deng Deng’ – the highlight of this burger. 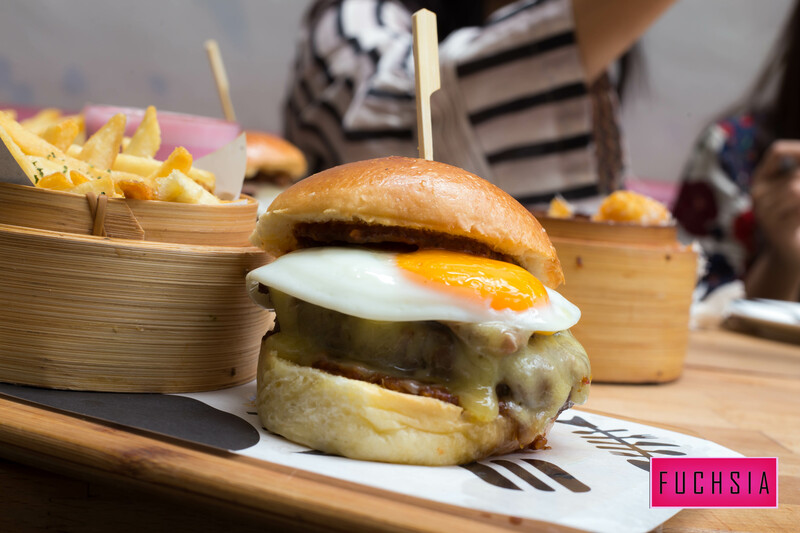 Dengerous offers a jam-packed burger with a grilled beef patty, beef deng deng, Gouda cheese, and a sunny-side up egg with Satay sauce. 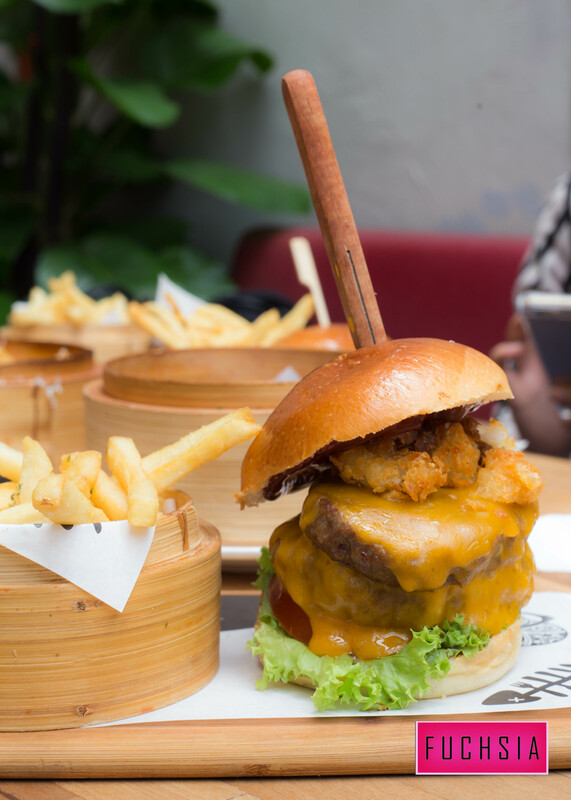 We must admit that this burger appealed mostly to the local Singapore palate – the combination of Satay and sweet peanut sauce layered over meat. The tender beef deng deng will definitely appeal to the locals. The burger had a lot going on with many layers to the taste but a little too heavy for my liking. Beef Lovers! We have the perfect burger for you! The Tower of Power included two grilled beef patties topped with Cheddar cheese, lettuce, onion relish, tater tots, tomatoes and smoky barbeque sauce. These ingredients come together to give you an amalgamation of juicy, gooey, crispy and tangy, making it unique, rich and if I may, simply awesome. The burger was huge, so be sure to be famished, or share it with a friend! Here’s one you can’t say no to! This burger was made especially for the many who’re obsessed with cheese. Topping the usual grilled beef patty we have double-Mozzarella, Parmesan, tomatoes, tomato sauce and basil. The hint of basil adds a unique Italian flavor to the burger. Now, who doesn’t love bacon? The grilled beef patty is topped with turkey bacon, caramelised onions, lettuce, tomatoes, and garlic aïoli with a generous topping of Swiss cheese. The caramelised onions add sweetness to the turkey bacon that truly complements the other ingredients, enhancing the overall flavour. I do feel however, that the bacon may have been slightly overpowering and perhaps an additional ingredient of jalapenos would balance out the flavours here. Here’s a local special! The Bandung Latte was an easy-to-have drink, served in a small glass with a biscuit on the side. The drink comes in its original form and also ‘Dirty’. A Dirty Bandung Latte includes a shot of espresso. So if you need your caffeine fix for the day, definitely go for the dirty variation! The Latte was smooth and foamy with a creamy texture – also served in a small glass with a biscuit on the side. I also sensed a distinct roasted aroma, that added more freshness to every sip. We were told that Working Title uses Brazilian and Indonesian coffee beans that are roasted weekly. Give your meal an indulgent finish with the dessert platter, consisting of a perfect trio of desserts – three mini churros, a chocolate tart and an ice cream burger. Churros: Delightful Spanish doughnuts rolled in cinnamon sugar, served with dark chocolate dip – they were just right! Tart: The tart was the perfect combination of rich, creamy and crispy – a definite must-try for chocolate lovers! Ice Cream Burger: This was my first encounter with an ice cream burger – a vanilla ice cream scoop, wrapped within a toasted bun, topped with cereal and crushed Oreos, accompanied with chocolate syrup drizzled on top. And if that isn’t enough, when you slice your spoon through this delicacy, you’ll be met with a peanut butter surprise in the center of the burger that hits you by your third bite into the meal. Sounds like heaven? IT SURE WAS! I highly recommend Working Title as your next foodie adventure! The restaurant thrives on being creative. It offers menu choices that aren’t available elsewhere such as the Ribena Wings and Dengerous. If you’ve got friends visiting from out of town, you definitely want to bring them here! Please ask for Rahman, the manager, who will enlighten you with historical encounters on how each dish was created. He also serves you with top-notch hospitality! Working Title’s food is addictive and I can’t wait to bring my burger-loving-husband there!